← Les “Tambours tourangeaux” ~ playing in Descartes this Sunday! 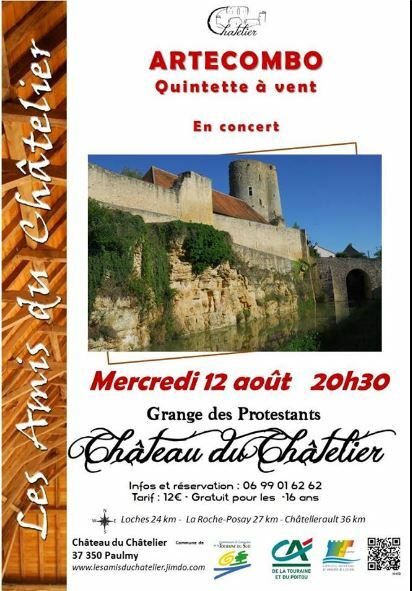 Sandra and I attended the last two concerts at our local Chateau ~ and a fine time was had both times. On the evening of August 12 there’s a further chance to listen to some great music from the wind quintet, Artecombo. They will be playing selections from Mendelssohn, Granados, Ligeti, Hisatome, Ravel, Sibold and Gershwin. This entry was posted in 21st Century, Arts and tagged Artecombo, Arts, Château, Le Chatelier, Loire Valley, Touraine. Bookmark the permalink.